Knowing when to say goodbye ain’t easy. It can be made harder when you may care, or even love the person. But does there come a time for you to walk away? It can be difficult and at what point does enough become enough? People can change and sometimes familiarity breeds contempt. Or situations can sometimes expose a side you may have never seen in a person before. I’ve known some people for years but it wasn’t until pressure hit that I saw a more sinister side to them. 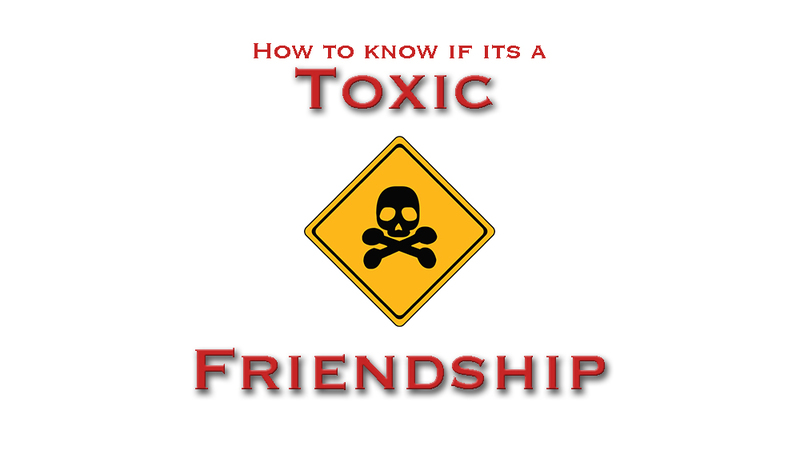 When a friendship becomes toxic, can there be resolve? I will state very strongly that I’m not talking about marriage in this post because marriage is something never planned to fall apart, sadly it does sometimes but this post isn’t about marriage, its about friendships. Friends can become toxic, because unlike marriage, they don’t have as vested interest in working it out as say a married couple might. From research and personal experience here are some key points to consider when considering “shall I say goodbye?” Some are obvious, others aren’t so. If a friendship causes you physical harm. This is an easy one. If your friend is beating you up and its against your will, clearly it isn’t wisdom to have that friendship continue. Its not possible to have a close relationship if trust gets broken. However we can’t always jump to conclusions either. Give them the benefit of the doubt and calmly ask them what was said or done and give them the chance to see the error of their ways. They may not have known they broke trust, or they may not have done it on purpose. My point is don’t just drop a friendship over one incident but instead tell them you perspective on it and hopefully it won’t happen again. If it does then stop giving them information that you deem private but you can still try to keep the friendship going, but keeping in mind they have trust limitations. Do they pull you down emotionally? Are they always moaning when you spend time with them? Misery likes company and moaners don’t like being lonely. There will be days when you need somebody to have a chin wag with (a chat), and maybe a bit of a moan. The problem comes when its on a regular occasion. When you dread meeting up with somebody its good to ask yourself why. Maybe they are a gossip or a complainer all the time. If this is the case and your mood is constantly being pulled down, there may be a problem. This can be a difficult one and is discerned or gauged by actions and words more so. Do they laugh when something is at your loss? Do they seem happy when something goes bad for you or somebody else? Do they act condescending towards you when others are present? Do they never compliment you even when others are? Do they put you down to others? Do they get envious of others regularly? And lastly do you feel it from them? I have found that when a person was jealous of a person you could pick it up over time. It was something others would notice. Now please understand that jealousy isn’t always a huge deal breaker but if you can still be friends and its not too much of a problem then the friendship can survive. A great way to deal with it is to encourage the person thats jealous. Jealous comes from an insecurity and a bad self image, so if you compliment them they will feel less inferior to you and so the jealousy goes down. This does take work, time, and patience. If you have a friend who hangs out with you but is never there for you when you really need them. This can be a problem but not necessarily the end of the friendship. Some people just aren’t reliable and its nothing personal. You may not be close friends but there’s nothing to stop you from being friends. If the opportunity arises to let them know your views, I would talk with caution for if they have a history of being unreliable they may have heard it before and be frustrated with you badgering them about it. So wait for the right time and carefully approach the matter, but don’t fall out over it. If you argue a lot its not always the question, but more do you get offended alot? One of my good friends will argue stuff with me from time to time, but we are great friends because of this. It sounds strange, but when there is maturity you can agree to disagree and even have a laugh about it. Just cause you argue over science, history, current affairs, or opinions on things, whats wrong with that? If we all thought the same the world would be pretty boring. Agree to disagree provided their opinion won’t have a negative effect on you. So in the case of topics you disagree on, my advice is don’t discuss those ones. If the arguments result in stress and tension on a regular basis its worth having a chat with them and deciding on the future. Does this friend bring the best out in you or the worst? Are you a better person because they are your friend? Sometimes people we like may not be good for us. I had a friend growing up whom my mother was not keen on. When I was with him I became a brat. Of course at the time I thought he was cool, but I failed to realise that he was bringing me down a wrong path. As a young boy I didn’t see it , but I see it now. As an adult we can be sucked into a bad friendship with out realising it. Its not about what can you get from a friendship but more to the point is what I’m getting out of this good for me or bad? We may not invite everybody around for tea, or send them Christmas cards. Sometimes a friendship can lack a bit of love so to resolve this try be the instigator and do something for your friend. Show them you care. Don’t go necessarily telling them that you love them, but do something nice. For guys its not always easy as we aren’t that way inclined to tell each other positive affirmations. But wouldn’t it be nice if we started to encourage each other once in awhile, or bought each other a coffee or something. Actions always speak louder than words. There is only so much a person can take so if they are constantly treating you badly and there is no stopping after you speak to them, maybe its time to call it a day. To sum it all up its simple. If we want friends we must be friendly. But it doesn’t stop there, we must be patient, kind, and exercise self control. We are going to upset people from time to time and vice versa. Perfect friendships don’t exist, but good ones do. Don’t forget the times you’ve shared, or the laughs you had. Just remember that if its worth having its worth fighting for…I think Cheryl Cole sang that. Its not you, its me! How to keep things in perspective.